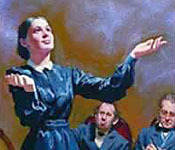 It doesn't take too much research on the internet to find a number of web sites critical of Ellen White. Are all the allegations justified? Are some of them just smoke and mirrors? Was the Pentecostal preacher correct who said, "That proves she's a true prophet. They don't attack false prophets that way." Or was he simply deceived? How accurate are the criticisms? This question is an important one. Suppose you want to help an Adventist see the "light" about Mrs. White. If your facts aren't facts, you won't get very far. But then, how is the average cyber surfer supposed to tell the difference between a real smoking gun and baseless gossip? That's where this section of our site comes in handy. We've done the digging and analyzing, and in a matter of minutes, you can see both sides of the story. Contradictions — Here we analyze allegations that Ellen White contradicted a clear teaching of the Bible. Hypocritical — Did Mrs. White "practice what she preached"? Did she claim one thing and do another? Top "Myths" — Here you can see whether there is merit in the allegation that certain claims regarding Mrs. White are just myths. Plagiarism — Was Ellen White inspired by God when she wrote her books, or was she just a literary pirate? Miscellaneous — Was Mrs. White wrong about who changed the Sabbath? Did she teach that after a certain time in the mid-1800s no more sinners could be converted? If you have a topic you'd like us to look at sooner rather than later, one you can't find yet in these pages, or if you would like to send comments or questions regarding our analysis, send us an email, and we'll see how quickly we can get it covered.